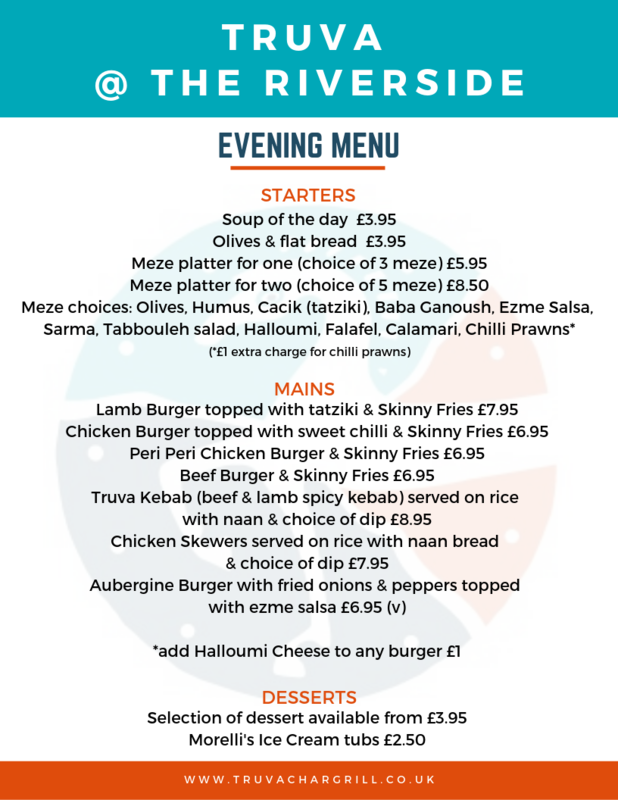 Truva @ The Riverside "Evening Menu" served from 5.30pm - 8.30pm, giving you plenty of time to enjoy our fresh Mediterranean delights before the curtain up if you are attending a show. (please note if you are coming to see a show we recommend arriving by 7pm at the very latest). Truva is also open for lunch and "lite bites" from 10am - 3pm Monday - Saturday, the perfect setting for lunch with fabulous views over the River Bann. To reserve your table complete the booking form below. Please let us know if any member of your party has any dietary requirements or allergy's. As a responsible data controller we take your personal preferences into account before sending you information about our products or services, please select the channels you would like us to contact you by. After 5pm on Friday's and all day Saturday. In addition to our day time menu we offer a special evening selection of some of our most popular dishes. If you are attending a show at the teathre we strongly advise pre-ordering at least 24 hours in advance, so we can have you in your seasts before curtain up.